To process the graph in a distributed style, the graph needs to be represented in a distributed scheme. Normally, there are two kinds of graph partitioning, vertex-cut approach and edge-cut approach. 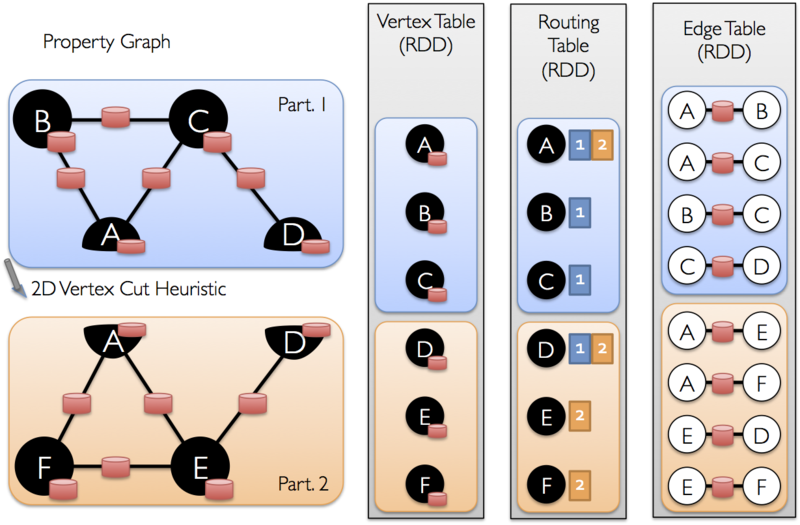 Spark GraphX adopts a vertex-cut approach to distributed graph partitioning. The strategy is programmed in PartitionStrategy.scala. Let’s look into this file. RandomVertexCut calculates the hash value of source and destination vertex IDs, using the modulo (by numberOfParts) as the edge’s partition ID. The edges partitioned into the same partition two two vertices have the same direction. CanonicalRandomVertexCut partitions the edges regardless of the direction. Another two partitioning schemes are EdgePartition1D and EdgePartition2D. In EdgePartition1D, edges are assigned to the partitions only according to their source vertices. A very large prime (mixingPrime) is used in order to balance the partitions. But such operation can’t eliminate the problem totally. As you see, E<v11, v1> is partitioned into P6. But it’s also clear that P1 contains too many edges (far more than other partitions) which results in unbalance of partitioning. So mixingPrime is also used in EdgePartition2D. Let’s look at a simple, realistic graph. Vertices A, B and C are in one partition; D, E, F are in the other. The edges are partitioned into two partitions as Edge Table. The Routing Table is very useful which records the cutting status of the vertices.